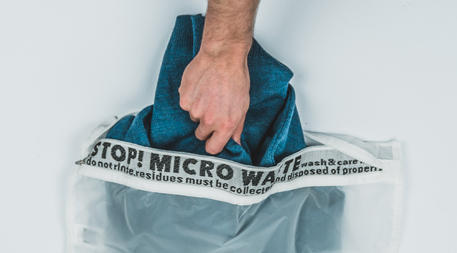 July 16, 2018 — Editor’s note: This is the final installment in a three-part series on the emerging threat of microfiber pollution. In part one we investigated where microfibers come from and where they are found in the environment. In part two we explored the implications for the environment and human health. One approach to reducing the release of microfibers into the environment revolves around altering textiles to make them less likely to shed fibers into the environment during everyday use or into water when they are washed. Several years ago the European Union funded a three-year, €1.2 million project known as Mermaids that involved a consortium of European textile experts and researchers along with the anti-plastic-pollution group Plastic Soup Foundation. In May 2017, Mermaids issued a detailed report recommending changes in manufacturing synthetic textiles, including using coatings designed to reduce fiber loss. Thus far, no manufacturers have announced initiatives to test any of the report’s findings or suggestions. Before committing resources to testing new manufacturing methods aimed at reducing shedding, representatives of the apparel industry say they want to figure out how much different kinds of fabrics shed so they can appropriately target efforts to reduce microfiber pollution. And that’s a sticking point right now. Some studies have sought to determine which fabrics shed the most. But parsing and identifying the exact types of plastics, especially microscopic fibers, found in environmental samples is difficult and requires expensive equipment that many researchers can’t access. In early 2017, the Vancouver Aquarium, through its Coastal Ocean Research Institute (CORI), announced that it was launching a comprehensive microfiber study with the hope of eventually being able to trace microfibers found in the environment back to the specific brand and article of clothing from which it was shed. Funding for the project includes a CA$50,000 grant from Mountain Equipment Co-op as well as undisclosed sums from outdoor brands Arc’Teryx, Patagonia and REI. Each of the retailers provided CORI executive director Peter Ross with samples of synthetic garments of various polymers, such as polyester and nylon, from their respective product lines. Ross and his team are running swatches of each sample through a battery of 90-day tests to see how they hold up to exposure to the elements. One set is placed in open air, where the swatches are exposed to wind, precipitation, temperature and humidity variations. One set it submerged in the bay water outside the aquarium, and exposed to biofouling, sea water, temperature variations, currents and aquatic life. A third set is submerged in fresh water. The group is also using an infrared spectrometer to determine the unique infrared “signature” of each fabric sample based on the unique mix of dyes and additives, and cataloguing signatures both of intact samples and samples that have been through the exposure experiments. The hypothesis is that weathering in these various conditions will give the polymers characteristic signs of degradation, thereby changing their infrared signature in predictable ways. One project goal is “to help us better understand how these fibers change over time with weathering,” explains Ross. Another is to create a spectral library that in the future can be used to identify the source (brand and apparel type) of microfibers collected from the environment. 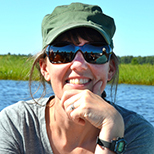 Katy Stevens, sustainability project manager for the outdoor gear industry consortium European Outdoor Group (EOG), is encouraging the textile industry to lead research on fiber loss, contending it is better suited than marine scientists to study textiles. She suggests the industry establish protocols for quantifying fiber loss from particular synthetic fabrics, then set standards aimed at keeping fiber loss to a minimum through changes to fabric manufacturing or construction. “Is washing even the biggest leakage point? We don’t know.” – Heather ShieldsThe American Association of Textile Chemists and Colorists (AATCC) and ASTM International are involved in a standards-setting effort with EOG aimed at being able to pinpoint just how much fiber any given fabric or blend of fabrics will release in washing machines. Stevens says the EOG will work with the International Organization for Standardization (ISO), which most European brands use, to ensure compatibility so that textiles can be tested to a consistent set of protocols, globally. The goal is to get a clearer understanding of exactly how apparel is contributing to microfiber pollution. Once apparel makers know which fabrics are the worst shedders, the next step is to experiment with new approaches to yarn and fabric construction. “[Shedding] has to do with the yarn twist. It has to do with the yarn fiber length, the fiber type, the yarn type as well as fabric density,” Silberman says. “There are a million different things that go into whether a fiber is going to [shed from] that fabric.” But, changes to the twist or using a different fabric content has a cascade of other impacts. “It effects the aesthetic, the performance, the cost of the product. It’s a humongous problem,” Silberman says. German outdoor apparel brand Vaude, Adidas, Polartec and WWF Germany are among the organizations that have embarked on a research program called Textile Mission, backed by a €1.7 million grant from Germany’s Federal Ministry of Education and Research. For the three-year project, the partners are contributing material and subject expertise toward collaboratively developing new fabrics and technologies that will reduce microfiber pollution, but are also “practical and feasible and scalable within the regular outdoor and sports supply chains,” says Hilke Patzwall, Vaude’s senior manager of corporate social responsibility. Another approach to reducing microfiber pollution could be to substitute biodegradable fabrics for the durable plastics used in most synthetic textiles today. Vaude is also testing biodegradable fibers. It is already using Tencel, a brand of lyocell cellulosic (wood-derived) polymer, in place of petroleum-based polymers in some of its products. According to Tencel manufacturer Lenzing, the fabric has been certified as biodegradable in seawater, based on a series of ASTM testing standards. Mango Materials, a Berkeley, California–based startup, has been developing a biodegradable plastic using polyhydroxyalkanoate (PHA), derived from waste methane, for the past eight years. CEO Molly Morse and and her colleagues stumbled upon a winning recipe for a PHA fiber last summer. “This is a type of polyester, so it has the same performance characteristics,” Morse says. “It is hydrophobic, so it wicks moisture. We’ve not tested it for odor retention but it is quick-drying.” Thus far, the textile industry has greeted news of the discovery with a lot of enthusiasm, she adds. Mango Materials has been able to make small textile samples and is now testing them for biodegradability in the Berkeley Marina. Vaude is using a biodegradable wood-derived polymer in some of its products. Mango Materials is working on developing a biodegradable plastic. Intrinsic Textiles Group makes an additive designed to hasten degradation of shed fibers. Photos courtesy of Vaude, Mango Materials & Intrinsic Textiles Group. Click to expand. Morse says it could take about two years to get to a point where their material could be mass-produced and used in apparel or other textiles. The company does not intend to sell its products to companies that will use common textile treatments that are also persistent pollutants in the environment, such as PFCs (per- and poly-fluorinated chemicals), she says. “When we think about solutions for the ocean, at present biodegradable bioplastics are not a solution,” Mallos says. Another California company, Intrinsic Textiles Group, makes Ciclo, an additive that is designed to hasten the biodegradation of shed fibers in wastewater or within a marine environment when applied to synthetic apparel during manufacturing. Ciclo claims that microbes present in wastewater treatment facilities consume the treated material. Company co-founder Andrea Ferris says 10 percent of fibers coated with its additive are consumed, based on lab tests performed to measure the rate of biodegradation in a simulated anaerobic-digester such as those used to process sewage sludge from a wastewater treatment plant. Ferris is working with four apparel brands that plan to release products using the additive next year. Some people, such as Karin North, watershed protection manager for the City of Palo Alto, remain suspect of the company’s claims, though. “This seems too good to be true without knowing what the additive is made out of,” she says. 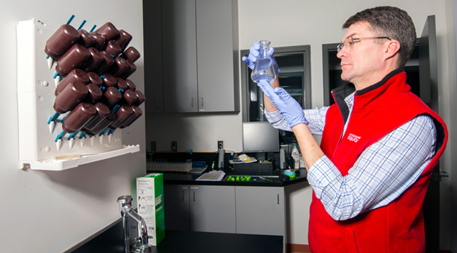 Laundering appears to be a key way microfibers make their way into the environment, and some washing machine filters — like those homeowners with septic systems sometimes use to reduce clogging — could become an effective way to keep microfibers from entering wastewater. In an unpublished study, microplastics researcher Chelsea Rochman of the University of Toronto found that a product called the Lint LUV-R collected 87 percent of all fibers released during washing. But installing such devices can be an expensive plumbing job. Rozalia Project, a nonprofit organization focused on eliminating microplastic pollution, produces a device called a Cora Ball that consumers can drop inside a washing machine to snag free-floating fibers; Rochman’s lab found this device to be 26 percent effective. A German retailer called Langbrett also sells a fine-mesh bag, called the Guppyfriend, designed to collect fibers. Apparel brands have been calling for washing machine manufacturers to help reduce microfiber pollution for years. Miele, a home appliance manufacturer, is participating in the German Textile Mission study, scheduled to last three years, by providing its washing machines for testing of textiles. In Japan, many models of washing machines have integrated filters that trap fibers. U.S. manufacturers do not appear to have taken any public steps toward integrating filters aimed at preventing microfiber release. Though the Association of Home Appliance Manufacturers is paying attention to microfiber pollution, “AHAM believes that this issue would be best managed early in the textile life-cycle,” says association spokesperson Jill Notini. Xeros, a company that makes specialized industrial washing machines that use plastic balls to clean textiles, announced that it has developed a special microfiber filter for domestic washing machines. The company’s global sustainability director Karen Mignone, says it can capture fibers with diameters of 32 microns or larger. Developing a clear understanding of the extent and consequences of microfiber pollution — and what can be done to mitigate any negative impacts — is going to take meaningful, long-term collaboration among scientists, policy-makers, appliance manufacturers and the entire textile industry. But consumers may ultimately be the key. Fast fashion — inexpensive but stylish clothing — “is where the change has to start,” Silberman says, noting the tremendous volume of apparel that brands such as H&M and Zara produce, as well as the influence they have on the textile supply chain. Read part 1 and part 2 of this series for the whole story. A lot of great work and info. Thank you!